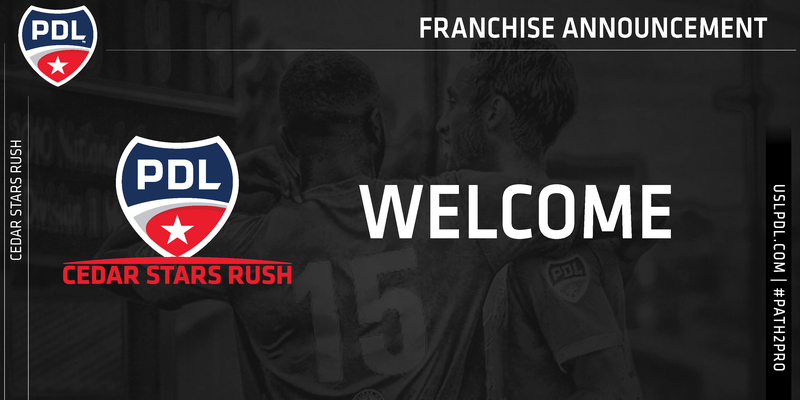 TAMPA, Fla. — The fourth new member club to join the Premier Development League for the 2019 season, Cedar Stars Rush will compete in the Mid Atlantic Division starting next year. Born out of a historic collaboration between Cedar Stars Academy and Rush Soccer, the Bergen County-based PDL club will strengthen collaborative ties between the two strong youth programs, adding an exciting platform to the Cedar Stars Academy (CSA) Player Development Pathway and offering elite-level players and current Rush alumni in college a chance to continue their growth towards the professional game. The club’s administration will also be a joint effort, with Rush alumni and current Rush Soccer Director of Operations Justin Miller serving as General Manager and Cedar Stars Technical Adviser Juan Santamaria serving as Technical Director. Cedar Stars Rush becomes the fourth new member club announced for the 2019 PDL season, joining previously announced Discoveries SC, Florida Elite Soccer Academy and Wake FC. It also becomes the league’s third New Jersey-based club, joining the nearby New York Red Bulls U23 and Ocean City Nor’easters in the Mid Atlantic Division. To stay up-to-date with Cedar Stars Rush, follow the club on Twitter, Facebook and Instagram or visit www.cedarstars.com and www.rushsccer.com. A deep passion and love for the sport of soccer, along with a desire to give opportunities to young people, drove President George Altirs to form Cedar Stars Academy (CSA) in 2011. Today, more than seven years after the inaugural season of the green and white, and through the connections to international brand Capelli Sport and its global network, Cedar Stars Academy is recognized as an international soccer program with an inclusive player development pathway that stretches around the entire globe, elite-professional coaches, and top facilities that help to facilitate player growth and development. With more than 2,000 active male and female athletes, Cedar Stars Academy currently has nine branches, which includes official membership within the United States Soccer Development Academy Program (DA), recognized around the U.S. as one of the top platforms for player development and competition, as well as USYS National League participation and competition. Rush Soccer is an international sports organization focused on the development of soccer players. Rush Soccer has partnered with over 85 clubs across the globe and provides comprehensive club development curriculum that benefits over 32,000 players across the globe. As one of the largest soccer clubs in the world - and with an ever-expanding global footprint - Rush Soccer is creating a brand of soccer unavailable anywhere else in the country. The organization’s extensive network of professional coaches and technical staff are dedicated to the betterment of soccer in the United States and developing a better quality of soccer player within the Rush system.